analyse everything around: What makes a superpower,and how the reserve currency born? What makes a superpower,and how the reserve currency born? Hypothesis: The necessary and sufficient condition for the reserve currency is a naval power that better than the second /third naval power together. 1. 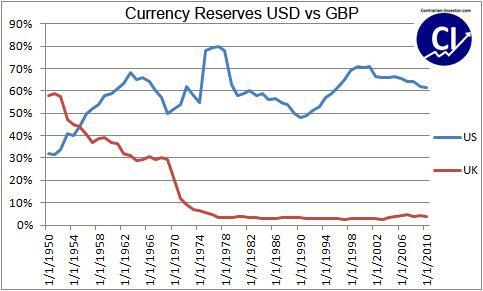 The pound lost the reserve currency status AFTER the US became the NO one navy, and by huge margin . 2. By sea shipment it is possible to reach 94% of the humankind, and best part of the earth population is arranged around the seashores. 3. The country with the biggest navy can close/open the sea lanes, and it means that for every trading country they are the table point.Every other country can be blocked by the given country - so the currency of the sea superpower has the lowest risk. Based on the above logic the currency of China can replace the dollar only if the Chinese navy will be the No.1 sea power. At that point the Yüan will set the value of everything,and the world will force China to accept the reserve currency status,. nice table on the Wiki , showing that the US build seven times more ship during the second world war than everyone together. The capacity of the US was more than seven times higher than the capacity of Britain.